Heavy, wet snow and ice can often cause branches on deciduous plants to bend or even break because they are frozen and brittle. On evergreens such as arborvitae, junipers, yews, etc., which have a broader surface on which snow and ice can accumulate, branches can be stretched and bent, disfiguring the shape of the plant and causing damage below the surface of the bark that will not become evident until Spring. If you are concerned about a heavy accumulation of snow on your landscape plants, carefully brush the snow aside by hand to avoid causing damage. Avoid shaking or striking the branches with brooms or shovels as this can cause more damage than it prevents. Bear in mind, that natural snowfall or windblown snow seldom results in plant injury. It’s usually the devices we use to remove snow that cause the most damage. Snow that is plowed, blown, pushed into, or thrown over plants is denser than natural snowfall and tends to stick together, so as it settles, it can rip branches or snap buds from limbs. Snow serves as a great natural insulator because snowflakes have small intricate spaces within their structure which are filled with air. These spaces trap air in between the flakes as they pile up. These tiny pockets of air prevent circulation, thus preventing heat from being transferred by convection. As a result, the daily temperature penetration into the snow is minimal and plants are protected from frost and freezing conditions. Snow on the ground acts as an insulating blanket of mulch that prevents injury to roots, which generally can’t withstand extreme cold. The roots of most landscape plants can be damaged when soil temperatures fall below ten degrees F. Some perennials, whose roots are far more sensitive than woody plants, can be harmed when soil temperatures dip just below freezing. The snow cover will moderate temperatures, and once the snow melts, the moisture is beneficial to the plants. Of course, the best solution is not to cover plants with excessive snow at all. Avoid plowing, blowing, or shoveling over the top of your plants. Mark your beds in Fall with posts or reflectors if necessary to make them more visible under extreme snow conditions. Avoid piling “salty” snow near plants or on lawns. If you choose to use ice melt products such as rock salt on your walks and drives, keep in mind that this, mixed with the snow and slush that is piled around plants, can leach into the soil and harm roots. Plants will absorb these contaminants in the Spring which may cause die back and even death. If you must “salt”, use one of the more environmentally safe products such as calcium or magnesium chloride or an ordinary, inexpensive garden fertilizer, sand, or kitty litter mixed with equal parts of “safe” salt. Consider these plant care tips now before the snow really starts to fly as it is easy to forget them in the throes of one of Chicago’s blizzards or ice storms. By taking extra care now when removing snow or melting ice you can keep your trees and shrubs safe from snow injury and you will find them to be more hearty and healthy come Spring. This entry was posted in ILT Vignocchi, Maintenance, Shrubs, Snow, Trees and tagged commercial, plant health care, Salt, snow removal on January 17, 2018 by iltvignocchi. PART 3 of 3: The operational process from flakes to finished. Simply stated, it is our goal to remove snow and ice from parking lots, driveways, sidewalks, etc. as rapidly and efficiently as possible while ensuring the safety and mobility of the employees, tenants, and residents of our customers. As I stated last time, and it bears repeating, it all starts with our people; dedicated, capable, accountable people who care about the work they do and take ownership over the properties for which they are responsible. To achieve this goal, our people need the right equipment, selected for a specific purpose, and maintained to provide reliable and uninterrupted service. ILT owns and operates a large inventory of equipment used in our snow removal operation, which is allocated to specific job sites well before the first flakes fly and much of which is stored on those sites to facilitate the operation. Now to the operation. Our men have been discussing the forecast, confirming manpower and equipment status, and checking site conditions as a storm approaches. As the accumulation reaches the plowing trigger point, the crews head to their sites. Every crew member has been assigned a specific job but because every storm behaves differently, they must be ready to shift gears and adapt to a change in the game plan at any time during the operation. The superintendent surveys the property in general as the equipment operators jump in their machines (plow trucks, skid steers, snow blowers). The hand shovel crews get a head start in front of the machines. That head start is an important factor in the operation to avoid causing any damage as they work ahead of the machine operators to clear the areas in front of garage doors, windows, building entrances, and other tight places that can be risky for a skid steer or plow blade to approach closely. Emergency exits, fire lanes, accessible parking spaces, etc. are attended to first to ensure safe and passable access for those areas. The crews proceed from there around the site according to the predetermined plan, alternating the starting points and progression patterns from storm to storm so that no one area is serviced first for every event. Working in conjunction with Village snow plow operators presents its own set of challenges. It is usually the job of Village plows to clear the streets in an office park or residential community, which can work to our benefit or detriment depending on the timing of their operation. It is important for our crews to try and learn the patterns of the Village plows to minimize the frequency of return visits to clean up areas that we have already cleared that have since been closed off by the street plows. All of our men carry cell phones to communicate their progress to their supervisors, relay issues that arise, and to provide frequent status updates to the Snow Commander and Sales Manager throughout the course of the operation. Our customer service team stays available 24/7 to field phone calls, text messages, and emails from our customers who may have special needs or specific requests. Those are relayed immediately to the site superintendent for resolution. When the site superintendent feels like his crew is reaching a completion point, he will make one more pass around the entire property, checking to ensure that everything is clean and passable and that all of the details have been addressed. Once the superintendent confirms that the snow has stopped and been cleared to the point where ice melt can be applied effectively, he will instruct his crews to begin that operation. Generally, rock salt is applied to asphalt roads and a chloride based product is applied to concrete walks, drives, stoops, etc. Material in parking lots is applied from tailgate or truck bed spreaders while pedestrian areas are treated by hand to minimize spill over onto grass or planting beds. The snow has stopped, the storm is over, the pavement is clear and wet, and it is time for ILT’s crews to head out. Reserve crews are kept available to handle return visits and/or drifting and icing issues as they may arise during the course of the following day. Another successful effort by the ILT SNOW TEAM! This entry was posted in ILT Vignocchi, Snow and tagged iltvignocchi, landscape, snow, tips on February 12, 2016 by iltvignocchi. Last week we offered some interpretation of the terms of a typical ILT snow removal contract as they relate to the service provided to your facility or community. PART 2 of 3: The mobilization process: from forecast to flakes. It starts with our people; dedicated, capable, accountable people who care about the work they do and take ownership over the properties for which they are responsible. While snow removal is an occasional topic of conversation at ILT throughout the landscaping season, the conversation starts to get serious as early as August into September. At that point, the Sales Manager, Snow Commander, and Zone Leaders finalize contractual arrangements, take inventory of equipment, confirm staffing, and review property needs. By October, our assessment of the workload and the assignment of our resources is all but complete. Crews are confirmed and assigned their properties (repeating from year to year wherever possible) and equipment is allocated. The Sales Manager and Snow Commander then discuss our capacity to accept additional snow customers. 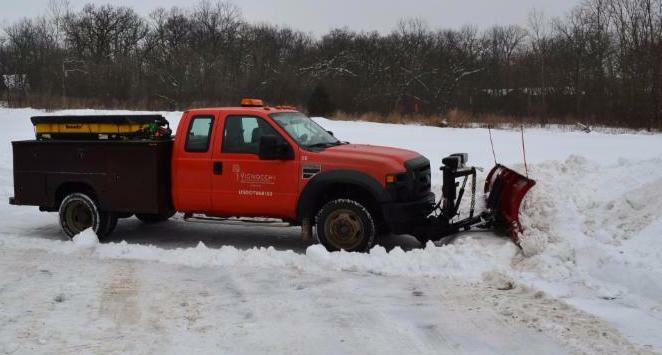 Unlike landscape maintenance, snow removal requires a very concentrated effort over a relatively short period of time. Therefore, we believe we should limit the number of customers to whom we offer snow service so as to never be over extended. We make a commitment to our customers to only accept as much snow business as we can manage under the most adverse of conditions, ensuring that all of our customers will be serviced in a timely manner during the absolute worst of circumstances. That said, now it’s November and we are ready. The key to making sure we are always equipped with the data we need to make informed, effective decisions lies in accurate, proactive forecasting. General media outlets can provide a good overview, but they do not offer much specific information. ILT hires a private forecasting firm to provide us with periodic and highly refined updates on every impending winter weather event, often 24 – 72 hours in advance, and then as frequently as conditions warrant. Specific information is sent to us for (90) different villages in the geographic area we service, containing data on precipitation, accumulation, icing conditions, freeze/thaw cycles, etc. When a weather event becomes imminent, our Snow Commander talks with this forecasting service to open a dialogue about the details of that event. She contacts our zone leaders to inform them of the forecasted conditions in each of their specific geographic areas. Additionally, every zone has an individual who is responsible to physically inspect and measure accumulations on each of our properties and report back on conditions. Once it becomes clear that service will be necessary, they agree on a mobilization plan which includes property specific start times, unusual manpower needs, special equipment status, material usage, etc. Snow personnel are then notified of the plan and of what will be expected of them. The information is also relayed to the Sales Manager to handle customer inquiries. No two snowstorms are exactly alike so each event must be analyzed independently. Our mobilization response must be organized specifically to address the characteristics of each storm by considering the following information. o What type of precipitation is expected? o When is the precipitation expected to start and stop? o How much accumulation is expected over that period of time? o What are the temperatures going to be like throughout the event? o Will there be freeze/thaw conditions; high winds, drifting, etc.? o What are any customer specific or event specific needs for this storm? The plan is in place, men and equipment are ready, and the storm hits at the exact time as was forecasted and behaves in exactly the manner that was expected. RIGHT??? 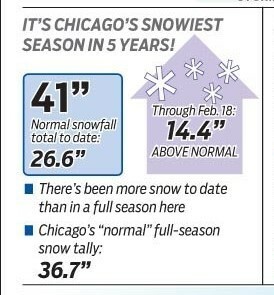 The only thing we can really be sure of when it comes to Chicago weather is that you can be sure of nothing and you better be ready for anything. Coming next time, PART 3: The operational process from flakes to finished. This entry was posted in ILT Vignocchi, Snow and tagged ilt, iltvignocchi, landscape, landscape ideas, landscapers, planning, snow removal, tips on February 8, 2016 by iltvignocchi. You rely on your snow removal vendor to make sure your roads, driveways, and parking lots are plowed; your sidewalks and entrances are clear; and your property is always safe and passable for your residents, guests, employees, and tenants. But in case you were wondering about the process that leads to making all of that happen, read on: PART 1 of 3: Understanding the snow removal contract. It all begins with the contractual agreement between the vendor and you, or your property management company, building owners, or HOA board members. Snow removal contracts are usually customized to meet the needs/specifications of the employees, tenants, or residents of the subject property, according to established budgetary considerations. (The financial parameters of the snow contract is a subject for a future post). But all snow removal contracts do have certain common elements. • The tolerance level (or trigger) determines the minimal amount of snow that must accumulate before plowing operations are to be initiated. The most typical is 2”, but 1” is not uncommon. Less common is a zero tolerance contract by which clearing is to be initiated after any snowfall. • The vendor’s arrival on site will usually depend on the timing of the storm. Daytime storms can create a need to keep main aisles, arteries, and entrances clear throughout the day until a more thorough clean up can be performed overnight. Evening storms offer a bit more flexibility on start time provided operations commence in time to have everything clean and passable by early morning, whenever possible. It is important to understand that plowing operations do not necessarily begin as soon as the trigger amount is on the ground. The start time for the clearing operation will depend on the expected total accumulation of the storm. If a given storm is forecasted to drop 3” – 4” of snow, ILT will likely wait for the storm to end before we commence our operations, then clear all of it in one push. However, if a storm is expected to drop more than that, we will likely do a clearing at 3”- 4” and repeat as often as needed to leave the property clean at the end of the event. • Deicing operations are not necessarily performed automatically after a plow event or an ice storm. Most of our customers put this decision in our hands, i.e. we are to use our discretion as to when and how much material should be applied to keep conditions safe. Others customers prefer to notify the vendor on a case by case basis when they would like them to apply deicing materials. • Operations such as return visits to clear drifting, checking for ice issues, cleaning up after Village plows, etc. are addressed specifically in the contract but are generally customized to the needs and budget of the property owner(s). Understanding ahead of time, the expectations set forth in the snow removal agreement between your property manager/building owner and your vendor can save lots of anxiety if you find yourself asking questions like: “Why are the snow removal crews not here yet?” “Why was no salt put down?” “The Village plowed my driveway/parking lot entrance closed, when will that be cleared?” Feel free to contact me directly with questions about your specific contract terms or contact our property manager/building owner. Kevin Block, Sales Manager @ ILT kblock@iltvignocchi.com Coming next time, PART 2: The process of mobilization; from forecast to flakes to finished. This entry was posted in Snow, Uncategorized and tagged commercial buildings, HOA, horticulture, ilt, iltvignocchi, landscape, landscape ideas, landscapers, snow, snow removal, tips on February 2, 2016 by iltvignocchi.